BerGenBio has presented encouraging initial clinical data of bemcentinib (BGB324) as an immuno-oncology agent at the ASCO-SITC Immuno-Oncology Symposium. Bemcentinib (first-in-class specific oral Axl inhibitor) was well tolerated in combination with Merck’s pembrolizumab (Keytruda) in patients treated to date from three different Phase II trials. Also, there is clinical evidence that bemcentinib enhances immune activity. Our base case valuation is unchanged at NOK31.34/share, but increases to NOK50.46/share when we take into account the broader potential of bemcentinib in immuno-oncology. Well tolerated with Keytruda Initial data from 37 patients from the three Phase II trials with bemcentinib in combination with pembrolizumab (Keytruda) suggest that few adverse events (AE) were caused by bemcentinib. The adverse event profile observed so far is very similar to that seen when pembrolizumab is used as monotherapy. This is an important finding given there are various severe AEs associated with pembrolizumab, and it is reassuring that these were not increased by bemcentinib. Clinical evidence of bemcentinib’s immune activity Analysis from the Phase II trial in acute myeloid leukaemia and myelodysplastic syndrome indicates that bemcentinib increases T-cell diversification. In six of nine patients, there was an expansion in their TCRβ repertoire in either or both peripheral blood or bone marrow. This supports the preclinical results and suggests that bemcentinib and pembrolizumab should work synergistically. Broad immuno-oncology potential deserves recognition Bemcentinib is being studied in three different indications (non-small cell lung cancer, triple negative breast cancer, and melanoma). If these trials deliver positive results, it is probable that development of bemcentinib in immuno-oncology would expand. To recognise this, we have valued bemcentinib’s potential in the indications where pembrolizumab is currently approved. 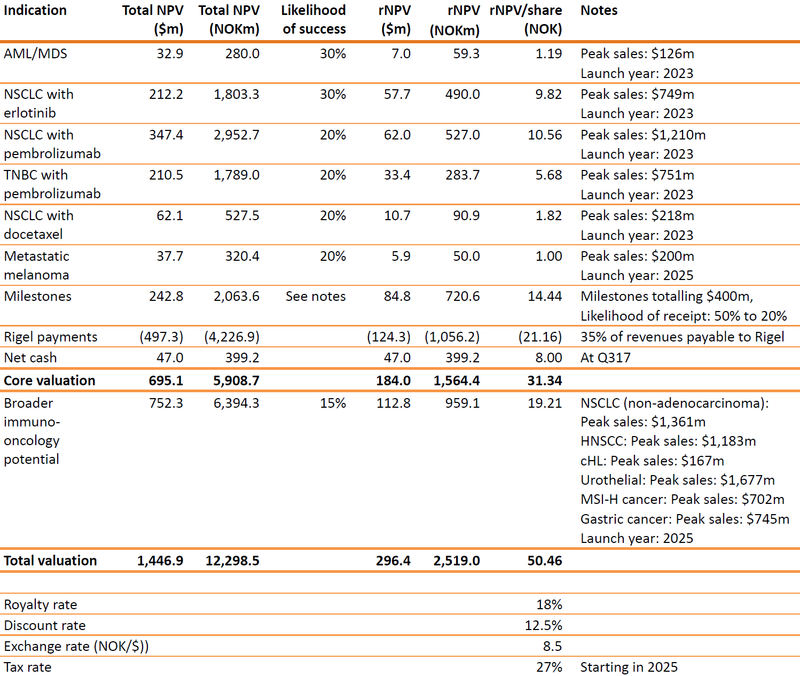 Our rNPV valuation of bemcentinib in these extra indications is NOK959m ($113m). Valuation increases to NOK50.46/share Our core valuation of BerGenBio (based on the current development programme) remains NOK1,564m ($184m), or NOK31.34/share. However, it increases to NOK2,519m ($296m) or NOK50.46/share, when bemcentinib’s broader potential in immuno-oncology is taken into account. BerGenBio’s bemcentinib (BGB324) has an exceptionally broad potential in oncology, as shown by the breadth of the Phase II programme (Exhibit 1). This is due to the fact that it is a first-in-class specific, oral inhibitor of the Axl receptor, which plays a key role in the formation of aggressive cancers (discussed in detail in our Initiation note of 4 January 2018). The potential is particularly sizeable in immuno-oncology, given the effects of Axl signalling within tumours and on immune cells. Within a tumour, Axl signalling has been shown to enable tumour cells to both resist immune cell mediated killing and to support an immune-suppressive tumour micro-environment. Axl inhibition not only reverses these effects, but also increases the anti-tumour activity of many immune cells, including cytotoxic T-cells. At the same time oncology care is being transformed by immuno-oncology therapies. 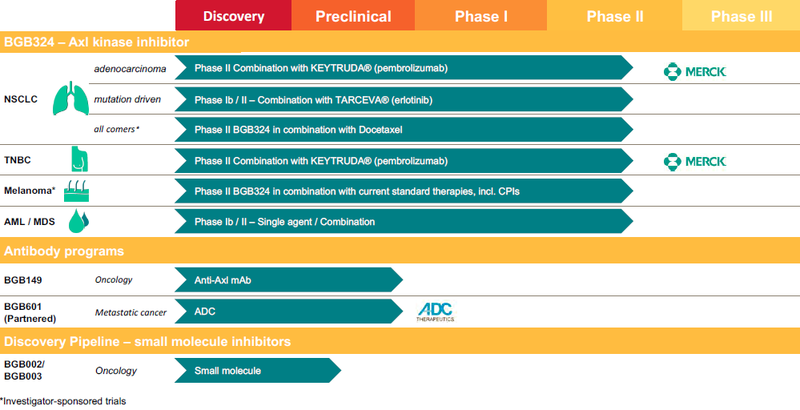 This is especially the case with the checkpoint inhibitors targeting PD-1/PD-L1 (such as Merck’s pembrolizumab/Keytruda), which are becoming a core component of treatment regimens in many oncology indications. Consequently, it is likely that the immuno-oncology development programme for bemcentinib will be expanded if there are promising results from the current studies in non-small cell lung cancer (adenocarcinomas), triple negative breast cancer, and melanoma. Hence, we believe it is prudent to assess the value of bemcentinib in immuno-oncology beyond these three indications, and to do so we assess the value of the indications in which pembrolizumab is currently approved. 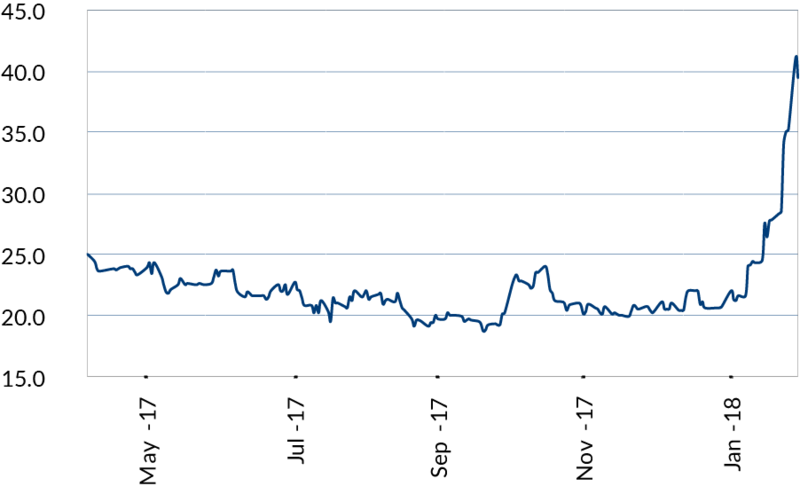 Our core valuation of BerGenBio remains NOK1,564m ($184m, NOK31.34/share), but increases to NOK2,519m ($296m, NOK50.46/share) after recognising the value of bemcentinib in the wider immuno-oncology field. Details of our valuation are shown in Exhibit 2. Source: Trinity Delta. 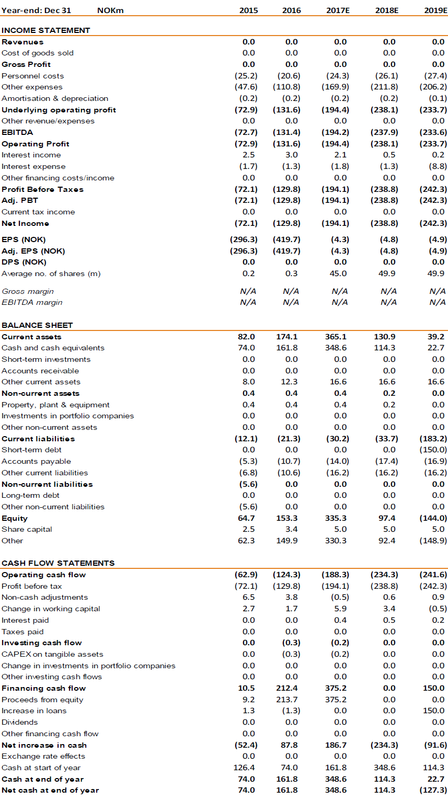 Note: Valuation assumes BGB324 is out-licensed in 2019. The value of each indication includes the current R&D expenses associated with the current clinical trials. HNSCC: Head & neck squamous cell carcinoma; cHL: classical Hodgkin lymphoma; MSI-H: microsatellite instability-high cancers (primarily colorectal cancer). Although we are now recognising the broader value of bemcentinib in immuno-oncology, we have still not valued bemcentinib’s wider potential in combination with chemotherapy or targeted-therapy regimens. This could be considered as additional upside to our valuation, together with its preclinical pipeline. There are no changes to our estimates.